Urschel Laboratories is a global retailer of food-processing machinery. Urschel has been designing and manufacturing precision industrial cutting edge equipment for many years. The focus has always been on finding innovative and efficient ways to improve customer productivity. Urschel has developed a worldwide reputation for excellence by working in partnership with customers over the years to meet the ever-changing challenges in the marketplace. Increases in productivity, new products, energy saving machinery, and cleaner, more precise cuts, are just a few ways Urschel has and continues to rise to the demands of this dynamic industry. EquipNet is constantly receiving used Urschel equipment through our exclusive contracts with our clients. Our inventory of used Urshel equipment through our exclusive contracts with our clients. 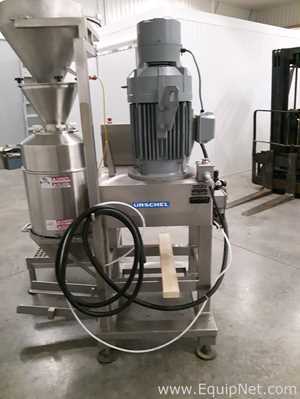 Our inventory of used Urschel equipment includes multiple Urschel GA Dicer's. If you do not see the used Urschel equipment you are looking for, call one of our representatives and we can find it for you. We can also source the right tooling and change parts that you need through our huge network of corporate clients from around the globe.